To look at data visualization concerning SA budget allocation click The Student Assembly budget: visualized. Every spring, the College of William and Mary’s Student Assembly creates its budget for the next academic year. 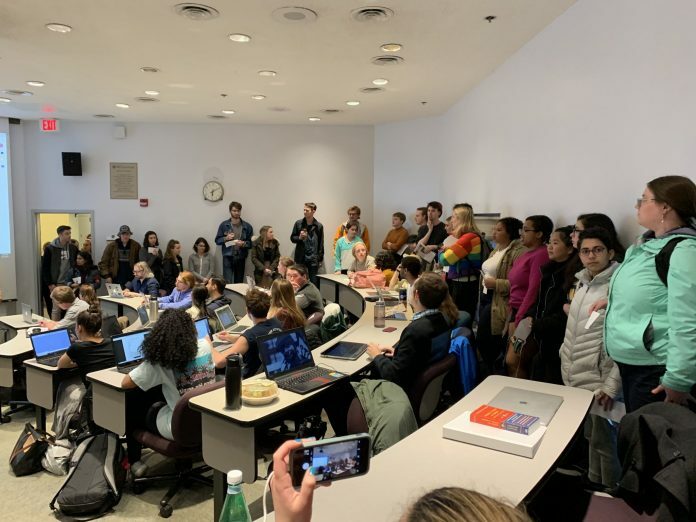 At its April 2 meeting, SA passed the Financial Regulatory Act, which reduces Media Council’s reserve funding from $75,000 to $55,000 for the 2020-2021 academic year after Media Council’s current contract ends. At the meeting, members of both Media Council and multicultural groups spoke to senators about their concerns. These organizations supported a $55,000 cap, as long as the potential $20,000 generated from the cap’s reduction towards multicultural organizations. Some groups were dismayed by the large amount of funding directed towards organizations on the Media Council. Media Council members informed the Senate that they were in favor of the $55,000 ceiling cap in their reserves. They also requested SA not lower the cap any further as some senators had been rumored to be considering an amendment that would lower the reserves to $40,000 instead. As multicultural groups expressed their fears about their lack of funding compared to publications on campus, representatives from Media Council organizations also began asking that any amount of funding above the cap go towards multicultural organizations. However, the $20,000 difference between the proposed and passed budget will not necessarily go towards these organizations. For funding to be allocated, Media Council must go over their $55,000 ceiling reserve cap. The additional funding can only be moved into the SA Student Activities Reserve Fund. Money from the SA Reserve Fund can only be accessed through legislation passed by senators, rather than from an organization-submitted request form. After public comment ended April 2, senators debated whether SA finances would allow for the $20,000 to be distributed to multicultural organizations. However, no clear conclusion was reached over what the funds will be spent on in the future and what groups the funding will end up going towards. Every year, students contribute $98 to the Student Activities Fee, which finances SA’s budget. For the 2019-2020 academic year, about 7,600 students contributed to the Student Activities Fee, resulting in a budget of $744,800. Then, the SA Executive Appropriations Committee — now chaired by Secretary of Finance Ryan Semsel ’19 and comprised of five to seven non-SA members — builds the initial budget. The initial budget must be balanced before the EAC is eligible to send the budget to the president for approval. The president then edits the budget, and in doing so has the authority to add additional funding to a group, take away funding as they deem unnecessary or alter the budget of one group for another group at their discretion. For example, outgoing SA President Brendan Boylan ’19 edited the funding of the Filipino American Student Association when the initial budget allocated $0 for their welcome dinner. Boylan allocated $400 to FASA for their welcome dinner. Boylan can also take away funding, which he requested the EAC do with regards to the Student Environmental Action Coalition’s proposed allocation of funds towards a community values training and for a gender-based violence workshop, which Boylan felt was not in line with the group’s mission. The Senate Committee on Finance receives the edited budget from the president and subsequently holds an appeal process so organizations can request funding for items that did not obtain sufficient funding in the initial budget. Appeals can be requested through contacting Sen. Jessica Seidenberg ’19 and Semsel. After considering those appeals, the EAC returns to the drafting stage and edits the budget. Some organizations find the appeal process to be difficult to navigate and feel that SA cuts funding from aspects of their group that are critical to the function of their organization. For example, Griffin Bhangra, a cultural dance group on campus, had over 94 percent of its initial budget request denied by EAC. Most of the funding requested by Griffin Bhangra was for extra expenses associated with its dance competition, like hotel fees. The group filed an appeal explaining that their organization provides an opportunity for students to participate through the medium of dance, while also acting as a cultural organization. The appeal cited some of the different events that Griffin Bhangra has participated in, including Day For Admitted Students, 1693 Scholar Events and South Asian Student Association cultural showcases. Griffin Bhangra’s finance chair Suhita Roy ’20 explained that in the past few years, students at the College have been trying to break into the Bhangra circuit. Roy stressed how important SA funding was towards Griffin Bhangra remaining competitive and competing in future events, especially at such a pivotal moment for their team’s entry onto the Bhangra circuit. The team will also be funding its first ever Bhangra showcase April 23 and aim to have the event grow in coming years. Following a successful appeal, the Senate Finance Committee adjusted funding for Griffin Bhangra’s competitions. After the appeal process, the committee submits the budget to the Senate, which subsequently recommends any additional edits. The Senate then debates and ideally passes the budget. Following its approval on the senate floor, it is then returned to the SA president, who decides to sign the budget or veto it. Boylan did not veto the budget for the 2019-2020 academic year. Vice President of Student Affairs Ginger Ambler then passes the budget off to the Board of Visitors to receive their approval of the budget, which completes the process. SA excluded the spending of the Spring Concert from the budget this year, as they allocated around $115,000 compared to the typical $50,000 the spend on concert funds. For the 2018-2019 budget, SA provided AMP with $25,000 for the collaborative Concert Fund, which goes towards the Spring Concert. In the fall, SA allocated its normal $50,000 towards the concert but added an addition $35,000 under the information that the additional funding could go towards a big-name, female singer. However, negotiations for this singer fell through. SA was then asked to allocate additional funding to the concert with the total equaling $115,000. In addition to the budget, SA has funds that it uses to spend on different categories of events, as well as the SA Reserve Fund. The money in SA reserves goes towards the bills that the Senate votes on throughout the academic year. During the 2018-2019 academic year, the Senate spent about $175,000 on various bills, spending the most — approximately $35,000 — on speaker fees. The remaining amount in SA reserves is about $60,000 with additional rollover, pending the completion of bills and the allocation of any unused funds. Any additional money that exceeds the $55,000 ceiling cap on the Student Media Reserve Fund will be placed into SA Reserve Fund. However, there is no guarantee that any funding will be placed into SA Reserve Fund, because any rollover funding depends on Media Council’s spending and allocation of money throughout a year. This contract will start in 2020-2021. SA allocates a large portion of spending to its Activities and Events Fund, totaling $40,000. Requests for the Activities and Events Fund are decided by the SA Finance Committee, and any requests above $2,000 are voted on by the entire Senate. According to Zakriya during the debate over the Financial Regulatory Act, SA has only run out of Activities and Events funding once before. The money from Media Council will remain in the SA Reserve Fund unless funding for activities and events is completely depleted. Based on SA financial procedures, there is no guarantee that the additional money will be used in the fund to pay for multicultural organizations, and there is no guarantee that bills which use the SA Reserve Fund will benefit multicultural groups on campus. Furthermore, there is also no guarantee that any money will be transferred to the SA Reserve Fund, as this requires Media Council to go over its $55,000 ceiling. Senators also cannot promise to “dog ear” funds to multicultural groups. The SA Reserve Fund can only be spent on bills passed through legislation on the floor. This process often requires multicultural organizations, or other groups on campus, to reach out to a senator and have them agree to sponsor a resolution guaranteeing funding. Based on this procedure, the possibility for extra funding will only go to groups who can work with senators to sponsor bills. If the additional money ends up in the Activities and Events Fund, this fund requires groups to make a request for funding. The money will only go to groups that make the request and get approved by the SA Finance Committee. Thus, the maximum $20,000 generated from Media Council cuts will not go solely to multicultural organizations. SA President Kelsey Vita ‘20 reminded the Senate that allocating the $20,000 generated from cuts to the Media Council’s reserves cannot be directly allocated to multicultural groups on campus. In addition to its Reserve Fund and Activities and Events Fund, SA allocates money to its Competition, Service and Conference Funds. Organizations like Debate Society and the various dance groups on campus often request money for their competitions from these funds which totals 10 percent of all rollover funding at the end of the year. For the current year, this fund allocated $14,259.37 to competitions. The National Organization for the Professional Advancement of Black Chemists and Chemical Engineers exemplifies the importance of possessing SA funding as a new organization on campus. President of NOBCChE Naa-Kwarley Quartey ’20 explained how the organization strives to grow with access to SA funding. Service organizations can also request money through the SA Service Fund, which allows for the funding of service events that reach the whole Williamsburg community and not just the College community. SA allocates about $10,000 for this fund. Any group that wishes to attend a conference can request funding through the SA Conference Fund. SA allocates $30,000 for these groups. After passing the Financial Regulatory Act at the end of the meeting, Sen. Anthony Joseph ’21 informed the Senate that they needed to think about the impact of SA funding and improve how SA allocates its money.